There were 219 press releases posted in the last 24 hours and 153,459 in the last 365 days. MIAMI, FLORIDA, UNITED STATES, March 7, 2019 /EINPresswire.com/ -- Do you ever feel stressed out at work? Do you ever get anxiety under pressure? Mental health, “hustle-culture”, work-life balance have become important topics in our conversations about the modern workplace, as we see a new approach to the idea of careers and entrepreneurship from new generations entering the workforce. 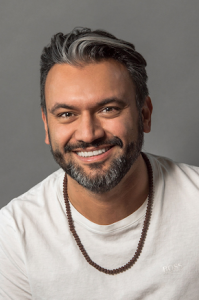 So if you have been feeling stressed out, now you can relax, because serial entrepreneur Dipanshu Sharma is bringing peace of mind and productivity to corporations and businesses with his new venture Meditation.LIVE. Dipanshu Sharma, who now lives in Miami FL, is originally from New Delhi, India. After growing up in New Delhi and graduating from DAVV University with a MS in Computer Science, D Sharma received an internship from Nokia in Finland and attended the Helsinki University of Technology. In Finland, Dipanshu Sharma wrote over 20 patents for Nokia. From Finland, Dipanshu Sharma moved to the Nokia office in San Diego, California. After just three months in San Diego, Dipanshu Sharma left Nokia and started his first company, involving speech recognition, and started down the path of entrepreneurship. Now, after founding multiple companies, advising many start-ups, and raising over $150M in funding over his career, Dipanshu Sharma has turned his focus to improving the mental health and corporate wellness of companies all over the world. Meditation.LIVE launched in July of 2018 and has Meditation Gurus or teachers, across the United States, Europe, and Asia. Meditation.LIVE Gurus hold live, interactive classes that are securely streamed to members across the world. Companies, hotels, and organizations set up a dedicated meditation room in their building where employees can attend these classes. For a fixed subscription cost every month, clients receive unlimited usage, and an unlimited number of employees or building tenants can use the meditation room. In addition to these live classes, Meditation.LIVE has on-demand classes so that clients have 24/7 access to yoga and meditation in the workplace, anywhere in the world. Also, Dipanshu Sharma has implemented the concept of workshops. Meditation.LIVE Gurus hold 4 to 8-week workshops on subjects such as intuition, stress reduction, meditation, healthy sleep, and more.